There are 100’s of wines to choose from! minimal sulfites and unlike the other guys…. WE DON’T USE CLEARING ADDITIVES! DON’T FORGET THE BUBBLES! TOAST THE HAPPY COUPLE! 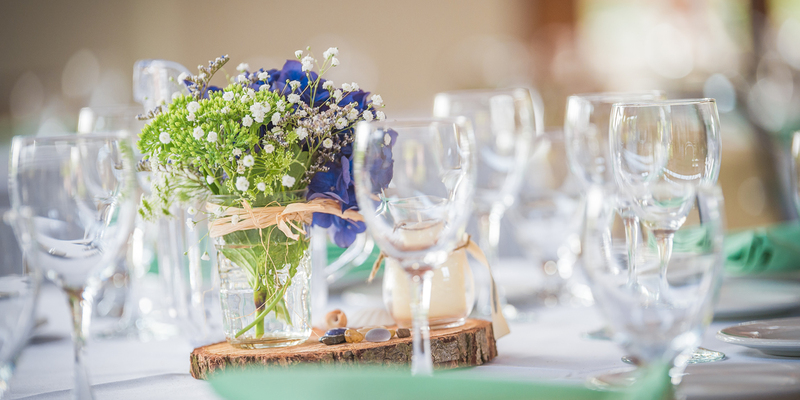 Add a personal touch to your wedding reception. Flying Fish Winery offers specialty packages of wines and beers. Get a kit going now and this Summer your wine will be ready to serve. Prices include wine, production fees, carbonation fee, corks, wire cages, foils, personalized image labels, taxes and bottles! Life is too short to drink bad wine….. and that is one thing you won’t have to worry about when you make your wines with us! Your wines are cold stabilized in our large walk-in coolers. While mellowing out the sharp acidic tones that you find in a lot of craft wines, this is also where they naturally drop their sediment. We use state of the art filter systems that won’t strip your wines of their colour, body, flavour and character. YOU are going to LOVE YOUR WINES AND BEERS! We have something to suit everyone’s tastes and pocketbooks! Come on by and talk to our wine experts! Buy extra wines and bottle in 375 ml bottles with personalized labels to give to your guests as a memento of your special day! 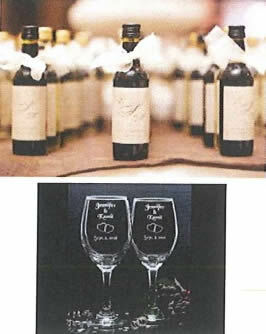 Custom etching of wine glasses and bottles are also available for that special party favour! Due to liquor laws, clients must come in to purchase and start their batches of wine and beer. We take care of all the nitty-gritties in-between. You return when your product is ready to bottle, cork, and decorate your bottles! A great job to include your wedding party in! 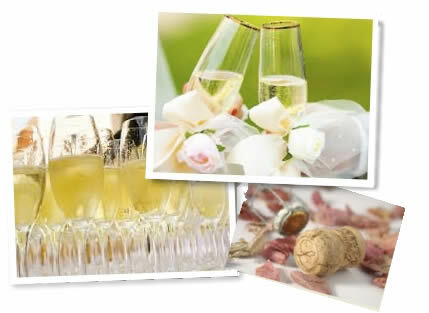 wines, production fees, corks, elegant foils, personalized image labels, TAXES AND BOTTLES! Choose from our 6 month wine package or our 3 month wine package! Our reds are fermented on crushed, wet winery grape skins, resulting in a full bodied red and our whites use a varietal specific yeast to bring out the flavour of the grape. Reds: Chilean Malbec, Chilean Merlot, Australian Cabernet Sauvignon, Australian Cabernet Shiraz. Whites: Italian Pinot Grigio, South African Sauvignon Blanc, Chilean Chardonnay. Our reds are fermented on dried winery grape skins enhancing the flavour and bouquet of your wine. 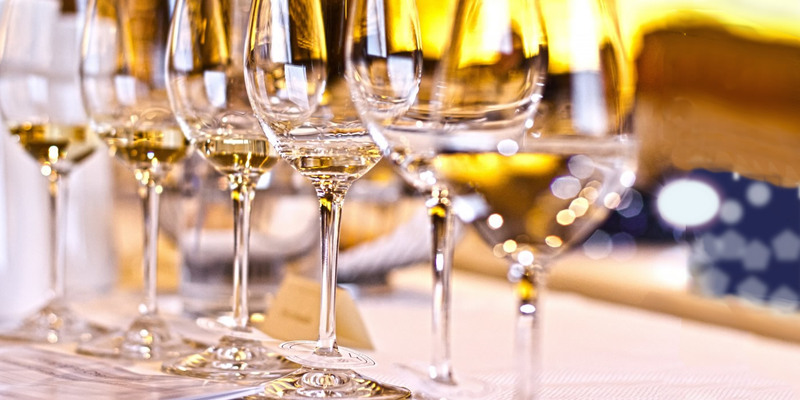 Our whites are sourced from leading vineyards and are a real treasure for white wine enthusiasts. Reds: Chilean Malbec,Washington Merlot, Australian Cabernet Sauvignon, California Syrah. Whites: Italian Pinot Grigio, New Zealand Sauvignon Blanc, Australian Chardonnay, German Gewurztraminer. Choose from our beer selection to make sure all of your guests are taken care of! Our beer batches fill 65 domestic beer bottles. Price includes beer, production fees, caps, personalized image labels, TAXES AND BOTTLES!